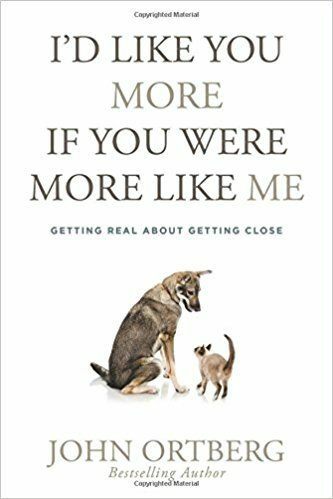 Pastor and author John Ortberg titles his latest book I’d Like You More If You Were More Like Me: Getting Real About Getting Close. Although we crave intimacy, it remains a scary concept for a lot of people. Therefore, intimacy cannot be coerced. For God desires connection, not compliance. Thus, the building blocks of intimacy consist of shared experiences that build meaningful connections. This requires the essential elements of time and presence. In other words, intimacy is a big feeling built on small moments. Details matter. And while the spiritual nature of God’s presence at first seems like a barrier to intimacy, God’s spiritual nature actually makes intimacy with Him deeper than with anyone else. Vulnerability, Pastor Ortberg observes, drives us to attachment, to intimacy. In moments of temptation, of aloneness, we make the choices that uniquely shape our character. Yet, only God’s big enough and strong enough to assure us everything’s OK. As John states, “Jesus offers to walk with you in the midst of your ordinary life today.” Jesus continually invites us to connect – and never gives up. However, our capacity for self-deception know no bounds. This creates a serious problem with intimacy. Thankfully, grace secures the foundation of Jesus’ call to more courageous self-awareness. In addition, His great love for us gives evidence that we’re worthy of love and belonging. This leads to Romans 12:15, a passage Pastor Ortberg calls “the golden rule of intimacy” – “Rejoice with those who rejoice, mourn with those who mourn.” There’s a magic arithmetic in shared experience. When we share joy, that joy increases. In contrast, when we share pain, that pain decreases. So, don’t put sadness in charge of your life. Rather, take your sorrow to God. Since Jesus exemplifies the ultimate combination of authority and vulnerability, He offers us ultimate intimacy. Also, God created us to have great authority and great vulnerability. It’s not a matter of having one at the expense of the other. In this process of commitment, we experience a freedom that avoiders never know. Finally, Pastor Ortberg defines the Deep Down Dark as “the place where you know you can’t make it on your own.” In the Deep Down Dark, groaning (complaining to God) in suffering builds intimacy. On the other hand, grumbling (complaining about God) destroys it. Furthermore, healing from shame – deeply embedded condemnation – only comes from finding an acceptance greater than our greatest rejection. As Lewis Smedes writes, we need the “spiritual experience of grace.” God’s grace readies us to make any statement or take any actions that prevents negativity from escalating out of control. Intimacy, John asserts, needs “outimacy.” It needs to overflow in love beyond itself. This happens in a community that lives and breathes Jesus. “I wonder if he [Jesus] whispers it still.